In the last couple of years I have struggled, creatively as well as physically. My submissions in that time have been work which I had already started, or completed previously. This year is the first year that I have elected not to submit work for the Lincolnshire Artists’ Society Summer Show. I did however complete a stitch course with Sue Stone through TextileArtist.org which is an online resource. I had started some pieces with stitch, and found inspiration to continue with my original plans with renewed vigour and confidence. 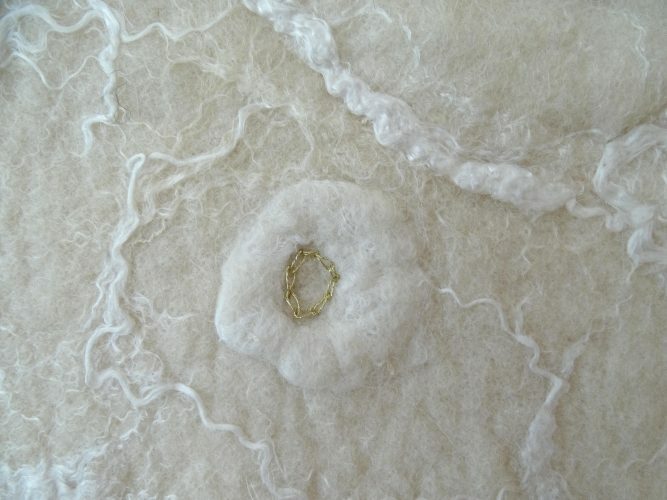 A stitched piece will be one of my submissions with the LAS, for their summer exhibition in 2019. My time has also been limited because of medical issues, although on the bright side this has allowed me to reflect on the wide range of work I currently have in storage. 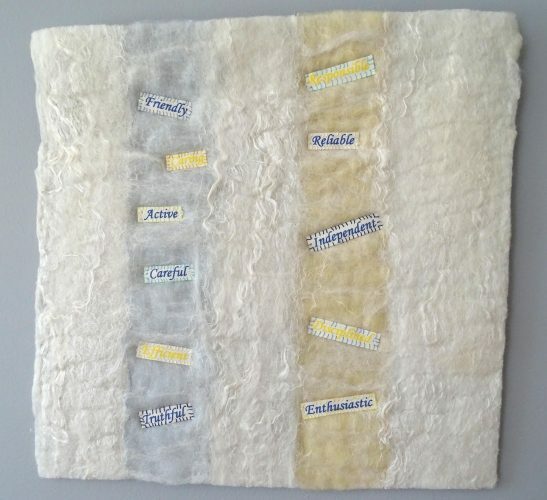 These pieces are one-off felts, made for exhibition either as a solo artist or with groups. I decided to move several pieces from storage for further development using stitch. The pieces I have selected for the Contemporary Crafts Network show have all been made since 2010 and show various felting techniques and a wide range of materials. Submissions for the CCN exhibition celebrating 30 years are currently being selected and the show runs at the Sam Scorer Gallery, Lincoln from Tuesday 14th to Sunday 26th August 2018. 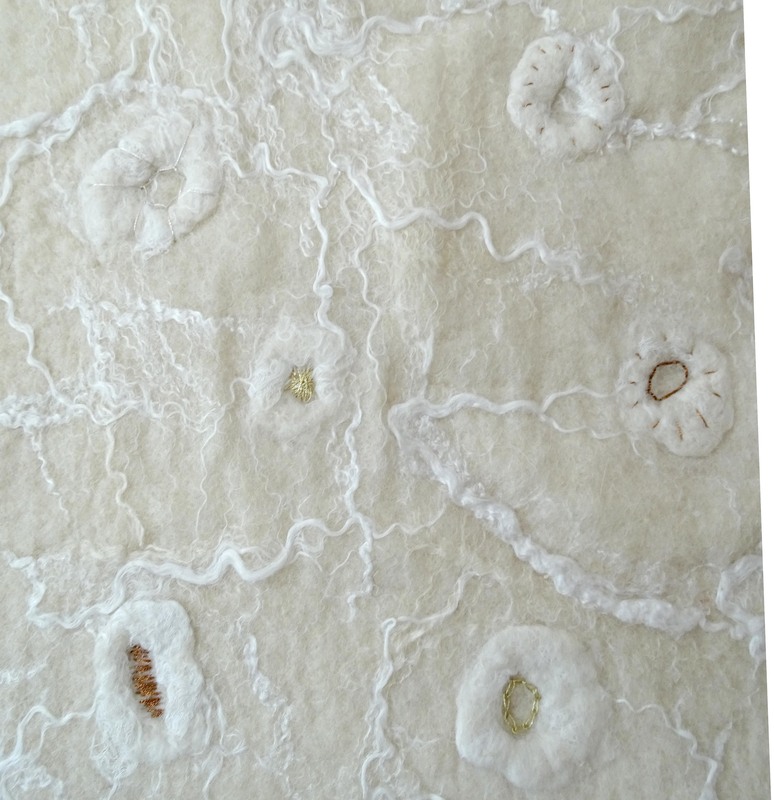 My first piece ‘Choice’ was completed in 2014 and has now been re-energised with stitch, enhancing the felt circles and defining some of the outer edges of the vertical sections. I have added a few simple stitches using metallic thread in and on the circles, and polyester silk thread for the rectangles. 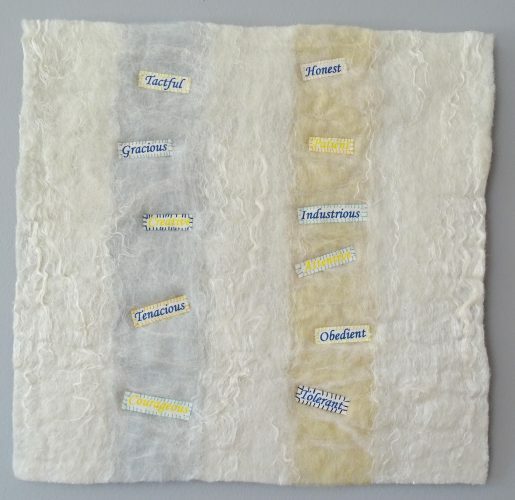 This was, originally, one of three felts; Choice, Freedom and Order, and was inspired by a Michael Brennand-Wood workshop. 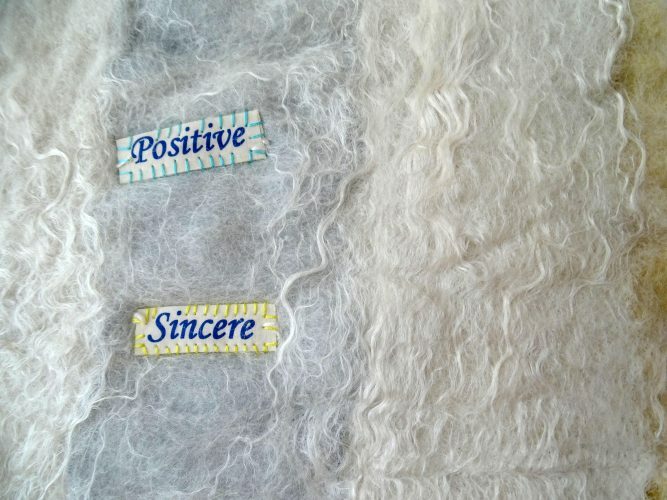 I have used merino batts; heavy weight and lightweight, blended – linen, merino and silk all white. 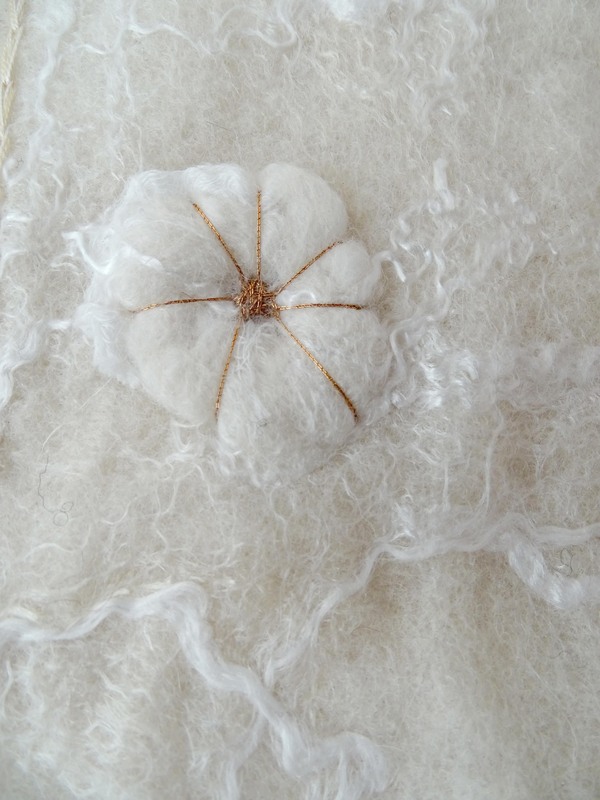 Remnants of fabric and white merino felt. The smallest shape is three layers of white organza, the next two layers of white prefelt, the third is white organza sandwiched between white batt and topped with a velvet type material, and the largest is a white flat fabric with a sheen. 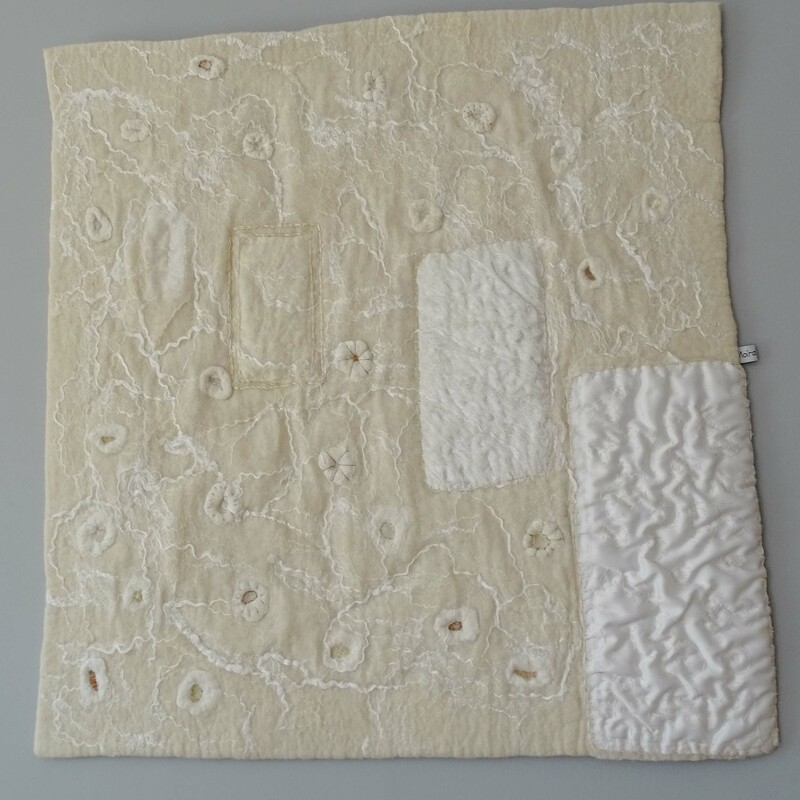 This last has been stitched in silk with circular shapes to create pattern and texture and this sits on top of layers of roving, organza and white batt which is lightly stitched to the base. Although a complicated felting process, because of shrinkage rates between the wool batts, fabric and blended fibres, it will provide interesting results. The fixing has also been changed by removing the original acrylic mount, and using a new system incorporating ‘Mistyfuse’ (recommended by Jane Dunnewold). A new felt backing has been added with metal slats and Velcro fixings. The title has been altered to ‘Choice Plus’. My final piece, ‘Longsight’, was made for a solo exhibition in 2010 and has been stored since then. 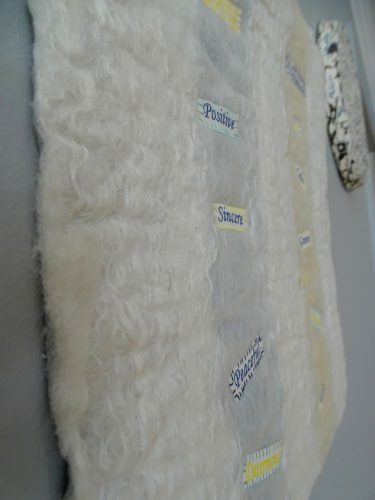 Sections include; alpaca, merino, organza, ramie, silk and viscose tops providing parts of the design and substrate for this wet felted wall hanging. 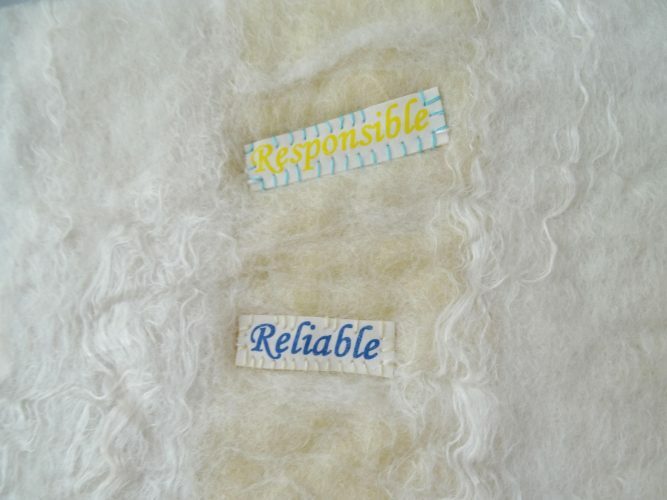 Additional wool was incorporated using an embellisher machine to create the design detail in the lower section. Sight is an important aid in communication, but for some people blocks of colour and blurred images are all they have to work with. When I made this felt it was for ‘A Sense of Felt’ exhibition in which I explored various aspects of invisible disability. Each piece was made to be handled and explored by visitors to help them understand what life was like for someone living with sensory distortion and invisible illness. 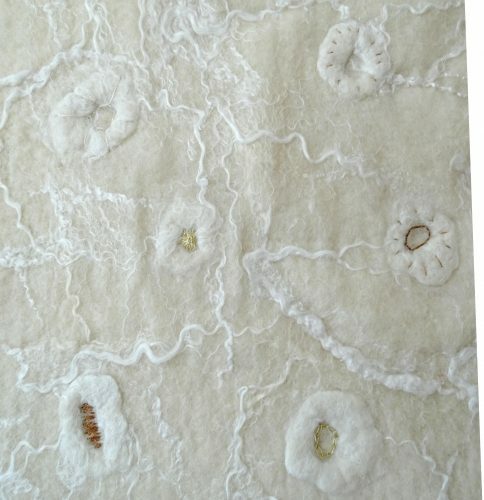 Felting the wool with organza has created a bumpy Braille like texture, created by the ruching of the organza during the fulling process. The only recent changes to this are the title, which is now ‘Sanctuary’, plus the addition of felt backing and fixing. Details of my work can be seen in more depth through my website. Always happy to discuss any aspect of my practice and can also be contacted via twitter and facebook.